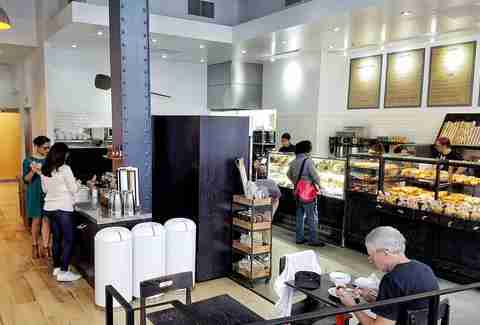 San Francisco is easily one of the best places for coffee in the nation. 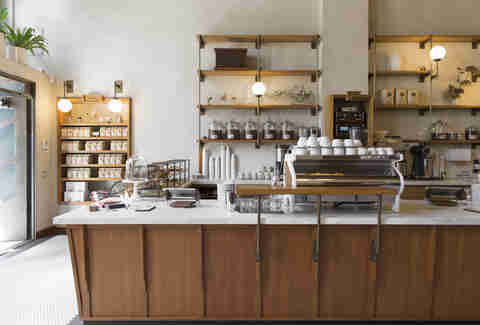 Where else can you get Blue Bottle, Ritual Coffee, and Sightglass all within one city? 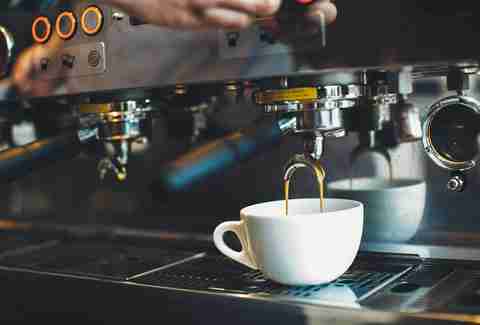 Over the past few years, the independent, hole-in-the-wall coffee shop scene has exploded, meaning you have more options than ever in your search for black gold. 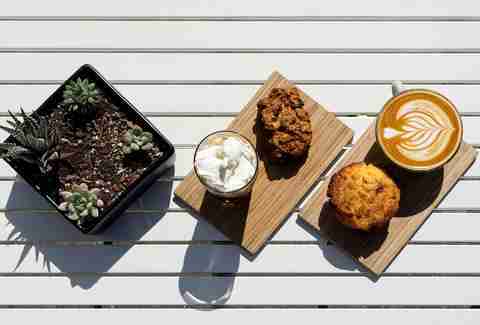 Here’s how to navigate the local coffee scene in every single SF neighborhood. 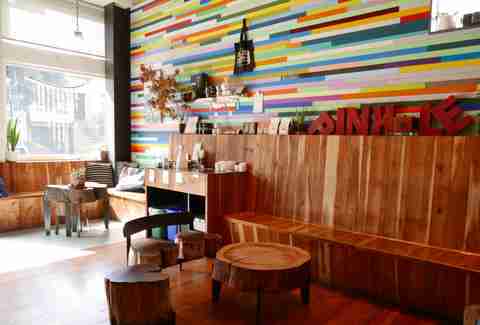 One of the most Instagrammed locations in SF -- because of their colorful, kaleidoscope-esque paneled wall -- Pinhole is one of the few places in Bernal Heights to get coffee, art, and conversation. It’s a newer spot compared to the Blue Bottles and Sightglasses of the city, making its first appearance in 2014, serving Verve and Linea coffee out of a former butcher shop dating back to the 1880s. Bonus conversation starter: The name comes from a photography term. In the heart of the Castro, Spike’s has been a long time supporter of the LGBT community by contributing to the Harvey Milk Civil Rights Academy and LGBT film festival. Don’t expect to get work done here. No televisions, no Wi-Fi, no problems -- or at least that’s the way they see it. If you’re going to Spike’s, you’re going to be dog watching from the sidewalk while sipping on some coffee or tea from a mug with their bulldog mascot on it. Bring your own cup for a discount. The bakery formerly known as La Boulange is one of your few options for grab-and-go coffee in the neighborhood. It’s a spot where you can either sit for hours sampling pastries and lattes or go in to get what you want and continue on with your day. Beware of their massive servings. Their cappuccinos and lattes are served in mini bowls, too small for soup but huge for a cuppa. If you’re interested in trying something new, La Boulangerie also offers house bottled beverages like coconut milk cold brew and ginger thyme lemonade. Donut lie. 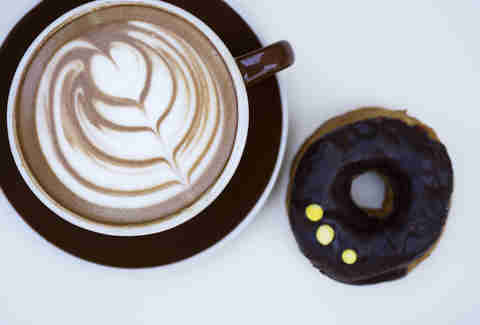 What you really want is a side of caffeine to make these O-shaped pastries feel less lonely. Dynamo Donut isn’t your average fried dough. Owner Sara Spearin comes from the likes of Foreign Cinema and Postrio. Today, her seasonal doughnuts are the stars, complemented by no-frills liquid black coffee... but you can get a latte if you want. Try the caramel de sel of the passion fruit milk to go with your morning cup. A joint-venture between Josey Baker Bread and Four Barrel, the $4 toast-serving Mill -- like the Four Barrel in the Mission -- has no plugs or Wi-Fi, so you’ll actually have to interact with (gasp!) other people while you’re there. This restaurant used to be a humble coffee bar where night owls could go to get a cup until 10pm. The bar is still the pride and joy of Piccino, and their continued love for coffee starts by serving Sightglass and urban trail mix. This is also one of the few spots in the neighborhood that has a full menu, wine selections, and pastries. Get a ginger cookie and a latte -- instead of milk -- for dunking. Equator Coffee started as coffee roaster out of a garage in Marin County in 1995. Today, as the first California coffee roasting B Corporation, they have multiple locations in the North Bay and SF with a focus on sustainable and transparent practices. Take in the urban weed murals before walking in, grab a cup, and then look at how cool said cup is. There's a tiger on it. You've ridden by the outdoor patio of Duboce Park Cafe on Muni, seen some person sitting outside, laughing with their coffee and adorable dog. Thing is, if you get off Muni, you can be that guy. Honestly, getting coffee here is just an awesome excuse to people watch. Skip Blue Bottle and head for a smaller local legend in the coffee biz. 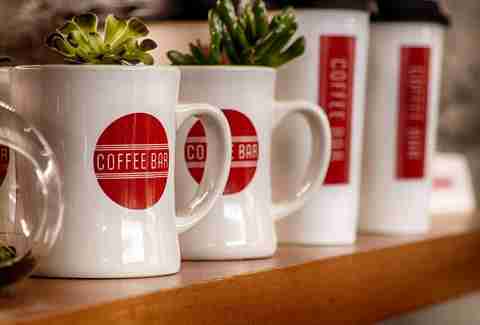 Visit their flagship location with floor-to ceiling windows for a light-bathed cozy Sunday vibe. They’ve partnered with Harvest moon cookies and rising star chefs to serve seasonal salads and small. If you’re lucky, they’ll have a bacon onion and poppy croissant to satisfy your savory tooth. Blue Bottle has been the long-standing soapbox for eco friendly craft coffee, providing coffee subscriptions accompanied with origin and farmer backstories and a celebration of single origin. With the recent Nestle acquisition, it’s TBD on what will happen to the brand and their message/ stance on independent coffee. But we're optimistic. This location is housed within the 1912 Provident Loan Association building that’s fully equipped with a siphon bar and an Oji iced coffee contraption. If you’re fascinated with coffee machinery, this is your spot to browse the most nostalgic coffee gear and history. Also, their NOLA iced coffee can get you through pretty much anything. You might remember Four Barrel from their anti-hipster tirade in 2012, which banned Instagram photos and so-called hipster topics. Their location is tough to spot if you’re not looking for it. 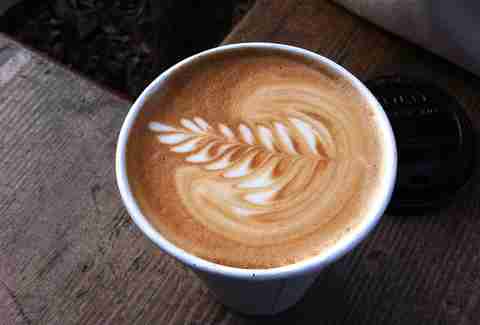 Four Barrel is all about coffee that's ethically sourced. This location itself is a great place to sit and spot SF’s colorful Victorian style homes known as the Painted Ladies. It’s also a great place to watch tourists pass by as you sip on some Ethiopia Hunda Oli. Unlike the Coffee Bar in the Mission with all the seats... and the beer... and the picnic table out front... and the man, the FiDi Coffee Bar is pretty great. This is a purist's coffee joint in the heart of the FiDi. Exactly what you need in the heart of the FiDi. If you’re at Fisherman’s Wharf, you’re probably stuck there doing touristy stuff with family (friends don’t let friends visit Fisherman's Wharf), so inject your faux enthusiasm for seals with Biscoff's European-style coffee. Every cup comes with a free cookie. Who says everything has to be overpriced at the Wharf? Who needs pour over and Chemex when you can have a Turkish coffee? This is one of the more unique local haunts in Richmond and serves as a cinephilia ode to old movies and independent film. Look for screening events whilst browsing the local art that hangs from nooks and crannies as you eat gravlax or a Turkish breakfast. The Liège waffle is also a favorite for dessert or a quick snack. 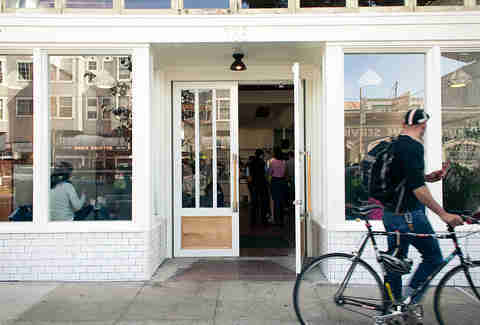 What used to be a pop-up shop made from a shipping container is now a Hayes Valley staple for anyone who knows SF Coffee. It’s great for grab-and-go or for those rare sunny days that you don’t mind waiting in line. The Hayes location also offers coffee tastings and cuppings for anyone interested in learning more about coffee. Look for the bright red banner with a hammer and sickle. Pro tip: they’re across the street from Smitten and kiddie-corner to Souvla. What do you get at Arsicault? 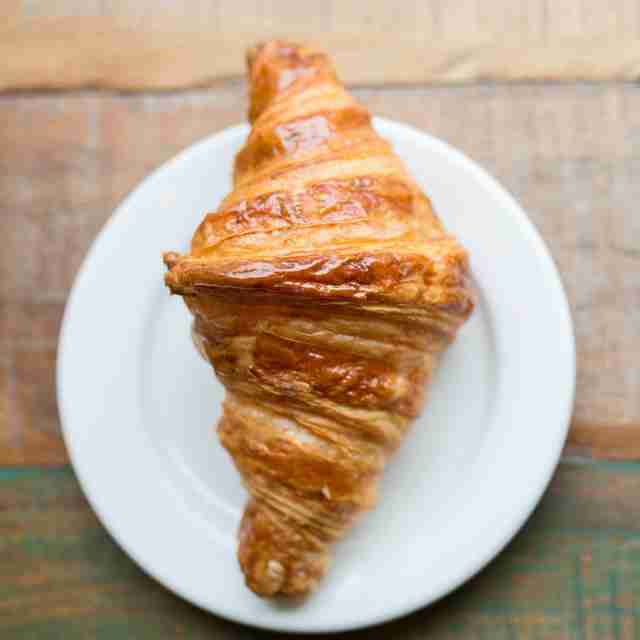 The best damn croissant you’ll have in SF, maybe in your life... with a latte. This tiny rustic French bakery got put on the national spotlight after Bon Appétit named it the best bakery in America in 2016. It’s one of the few places in the city that still does something well after getting major attention. The long lines that wrap around the block are well worth the wait, and it’s simple drip coffee. But it’s just what you want with an almond croissant that will make your eyes roll to the back of your head. Get there before 8am for a shorter wait and the best selection of coffee and/or pastry. 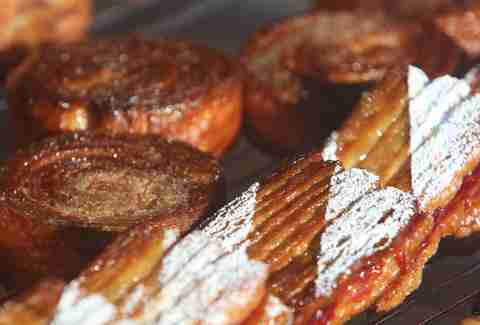 Their plain croissants shouldn’t be passed up, and their kouign-amann is a must-have. 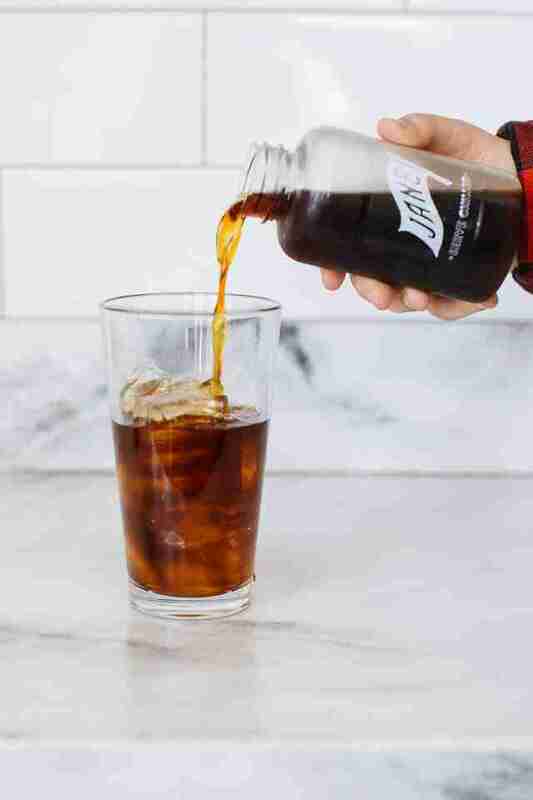 They’ll add a shot of syrup to your iced coffee if you ask nicely. Do you really need more reason than that? This Parisian-style café is just consistently friendly and inviting. And because it’s off of Haight, you’ll never have to worry about using the bathroom after someone who recently stumbled out of a bar. It doesn’t have to be your birthday to get the birthday cake latte, something that Instagram was ostensibly made for. Lately, this café has been home to social media influencers because of their creative takes on lattes, latte art, and craft coffee. In October, you can snap a picture of a jack-o'-lantern in your mug. They’ve also done unicorns, swans, and a Cookie Monster. Want even more color? Get the Lucky Charms toast to pair with your sprinkle-covered coffee. The brightness alone will help you wake up. Born in Berkeley and raised in Emeryville, Peet's recently renovated this Marina storefront into a 2,500 square-foot flagship featuring art from Bay Area artists and reclaimed-wood countertops. If you're gonna bite the Peet's bullet, this is one actually worth doing it at. Cumaica has been brewing coffee made with Nicaraguan mountain beans since 1993. It is, in the most literal sense, artisanal coffee. You’ll be able to watch (and smell) beans roasting on-site. Get their Italian-percolated moka (not mocha) and pair that with a muffin. It would be easy for Contraband Coffee Bar in Nob Hill to get lost in the shuffle of glossy white storefronts, unless handsome publications like this one made sure it didn't. The sunny interior will make you want to cozy up with your drip coffee for a little while, and here, that's okay. There are a bunch of these scattered around Noe Valley and the Inner Sunset, but its 24th Street address stands out because 1) it's the flagship, and 2) it boasts a sweet little parklet. This is a chocolate shop, but that’s exactly why the mochas are the perfect thing for a 45-degree day when the wind is nipping at your face. With each espresso, you can also pick out a chocolate truffle to pair it with. The oversized red lips mural will be your landmark to this unique North Beach experience. It’s also next door to the Italian Homemade Company, which makes it a wonderful post-lunch stop on your way to Fisherman’s Wharf. This is quite literally a "Garden" House Cafe, thanks to an epic back patio not even Karl the Fog can screw up. Tack on the fact that its house brew is surprisingly strong for such an unassuming cafe, and not even the cash-only-ness can keep you away from the GHC. When you walk in, step up to the wooden circular service counter, place your order, and prepare to ask yourself if this is the best coffee you've ever had. 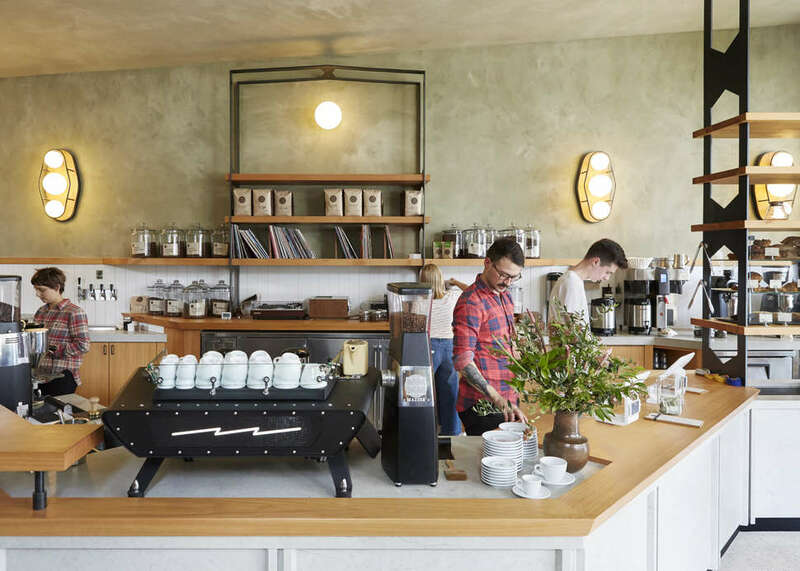 What started as a coffee cart (like most things in SF), is now much more than that with brick-and-mortar spaces that celebrate California modern design and latte art. The best part? It’s close to City Lights Bookstore, which is an icon of the neighborhood (and one of a handful of bookstores that seen to survive the Internet Age) and was founded in 1953 by poet Lawrence Ferlinghetti. Nothing like sipping Stumptown coffee in someone’s adorable closet/WAIT, THIS IS A COFEE SHOP?!? Now you have somewhere to get good coffee when you visit that one "friend" you have who lives all the way out in the Outer Sunset. Andytown roasts its beans in-house, and boasts a straightforward coffee selection, with one exception: The Snowy Plover, a shot of espresso, ice, sparkling water, and a dollop of cream. *Mic drop*. 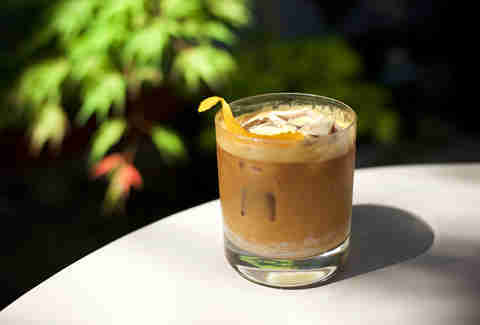 It's one of the 21 best coffee shops in the country, and that prestigious list nails it: "While many big-city coffee shops double as people-watching sites, Saint Frank is all about a serene coffee experience enhanced by blonde oak walls, skylights, and the fourth wall between barista and patron broken down by sinking the stylish Mod Bar espresso machines into the countertop. 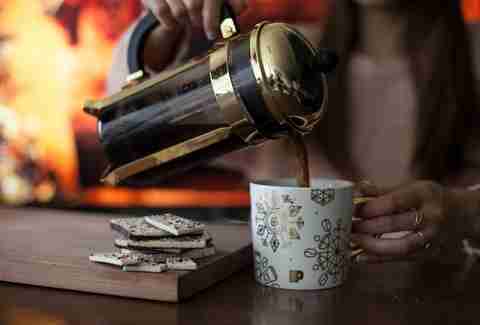 The founder entered the coffee world through local roasters Ritual, and he's still sticking with them, using the espresso in everything from lattes with house-made almond milk to a rarely seen espresso and tonic." Feel fancy as hell sipping on a café au lait from the same people who brought you Presidio Social Club. There are very few options in the Presidio beyond this spot. The menu is updated every week, so you’ll want to keep coming back and seeing what's new. The house-made chai or Arnold Palmer are good subs if you’re not feeling coffee. It’s also close to the Walt Disney Museum, the Yoda fountain, and some of the old navy houses. Beacon knows you’re just using them for their Wi-Fi, and they’re just fine with that. Like the lighthouse guiding ships, Beacon is your source for finding good things, specifically Sightglass coffee and Jane's pastries. 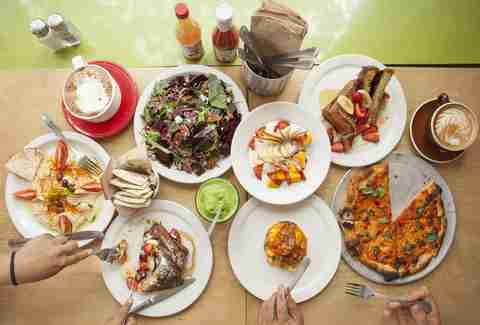 They also have a small menu of breakfast items that they make in-house, like avocado toast and their breakfast burrito or egg sandwich. The location is inviting with plenty of seating and upbeat tunes that play softly from the speakers. 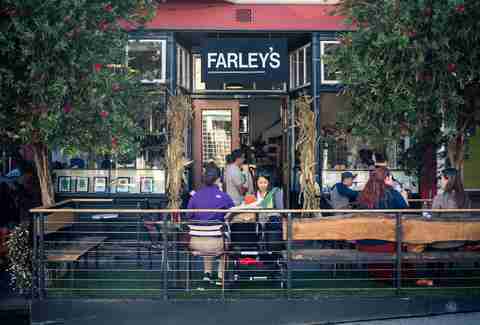 Farley's sorta feels like Cheers, except no one knows your name (fine by us), but everyone always knows your order (finer by us). Get a made-to-order cup before standing in line for brunch at Mama’s (one of the best brunch places in the city). 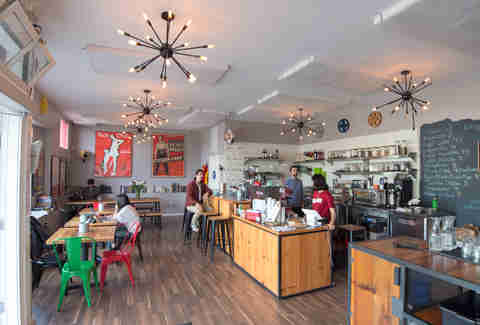 This is one of the more unique coffee experiences you’ll come across in SF. Walk past Washington Square Park and you’ll notice a counter that seems to be cut out of the building and two red folding chairs on the sidewalk. A DIY-looking menu gives you the options: Blonde, Brunette, Redhead, or North Beach. You choose one, and like a coffee-themed theater, a brown paper filter lines a porcelain cup with a hole, and your paper to-go starts to fill up with black liquid, drip by drip. Think of HITW as a simplified stay-put coffee truck that’s consistently without pretension or frills, with a coffee that costs less than $4. It's got solid, organic coffee options to go with more mind-blowing, homemade almond milk. Follow its Twitter for what to expect on the ever-changing menu. This tiny box corner of a café is one of the best indie coffee shops in the US. 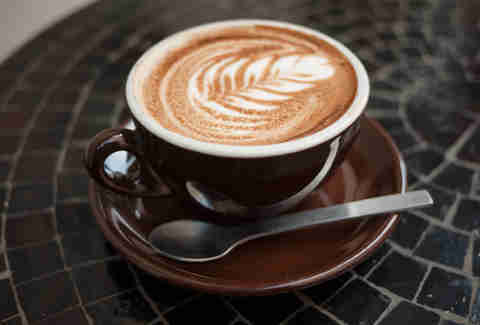 Coffee nerds will celebrate knowing that they’re sipping an espresso from a café featured on the Barista documentary. Founder Andrew Barnett was the judge at the World Barista Championship, so you know they’re passionate about creating the perfect cup. Linea also offers small bites and a damn good nitro cold brew. 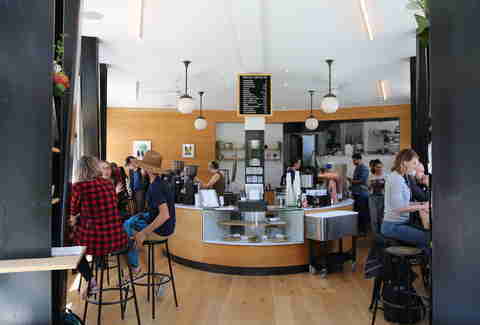 Sightglass has become synonymous with San Francisco's independent coffee scene. The operation all started in 2009 with a small cart and a few Chemex pots and has grown significantly. 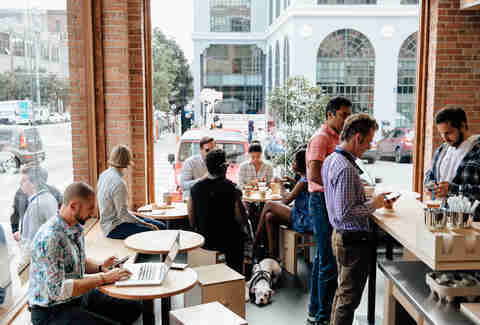 This particular Sightglass is the original, and as the flagship location, has an affogato bar on the mezzanine level where you can customize your ice cream + espresso. 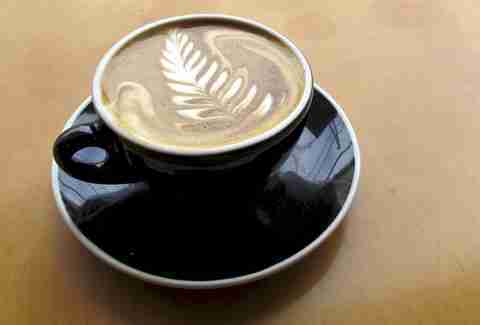 Before you go exploring Golden Gate Park or brave the sidewalks of Haight St, get your coffee fuel at Flywheel. Sharing a similar mentality to Philz, each cup is made to-order, with the beans roasted in-house. Margaux Poupard is a very, VERY caffeinated Thrillist contributor. Follow her jolted musings on Twitter. Urmila Ramakrishnan is a coffee snob caffeine addict who gets migraines if she doesn’t get at least one cup in before 8am. She’s also a food and drink writer based in SF. Follow her latte art on Instagram @mila_makes.